When young Christopher writes a letter to Santa Claus, he poses a question no one has ever thought to ask before: Dear Santa Claus, What do you wish for Christmas? 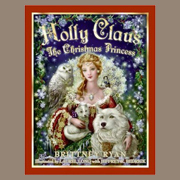 Miraculously, Santa’s longtime wish comes true, and a baby girl is born—Princess Holly Claus. But just as the Land of Forever joyously celebrates her arrival, far away an evil is unleashed. A curse is placed on Holly, freezing her heart in ice so her future will be bound by a world of darkness. And with the Gates of Forever now locked, Santa can no longer spread the magic of Christmas to children everywhere. As soon as Holly finds a way to make a daring escape, she begins an astounding journey to the Empire City, determined to free herself and, once and for all, bring back Christmas. This extraordinary and beautifully illustrated adventure is an everlasting gift of Christmas enchantment.